What part does religion play in Freedom Force? 9. Show tolerance, compassion, and good will toward all. Extend a welcome to members of all races, nationalities, religions, and cultures, provided only that they honor The Creed of Freedom. Expect diversity, knowing that, in spite of differences, our common mission binds us to a genuine global brotherhood. 10. Freedom Force embraces the highest principles shared by the great religions of the world but it is not intended to function as a church. It is open to those of all religious persuasions without requiring acceptance of any particular doctrine. While working with other members, refrain from criticizing or challenging their beliefs. Focus on those things that draw us together rather than those that divide. The long answer requires a deeper analysis. Throughout history, there always have been two faces of religion. One is a beautiful face representing a positive force for the betterment of mankind – not only for spiritual values, but social, intellectual, and artistic values as well. The other is a frightening face representing a negative force for intolerance, coercion, and so-called holy wars of purification. Over the centuries, countless millions of human beings have been slaughtered in the name of God – and the process continues to this day in the Middle East. Fortunately, in the rest of the world, religion no longer is a force for killing and coercion, although there are voices in our midst calling for a return to that paradigm. This, however, has been replaced by another phenomenon that, in the long run, may be even more devastating than holy wars. It is the paradox of using religious belief as an excuse for not opposing the organized forces of evil. If totalitarianism should triumph because of this paralysis on the part of religious people, they will become responsible, indirectly, for a new Dark Age of barbarism and slavery. There are some who feel that not proclaiming God (or a particular theology) as the foundation of our movement is a barrier to their participation. Their view is often expressed as: “We cannot succeed unless God is at the center of everything we do.” Most of us in Freedom Force are in agreement with that sentiment, but there is an assumption often tied to this concept that is not necessarily valid. The assumption is that God cannot be at the center of everything we do unless we write His name into our documents. Placing the name of God into documents is not really the issue. People do that all the time, and it is entirely appropriate as an expression of their personal faith and a motivation for their actions, but placing such sentiments into documents that are blueprints for a government or for an organization such as Freedom Force is an entirely different matter because it involves, not just those who write the documents, but also those who inherit them and are expected to abide by them. An excellent example of this difference can be seen by comparing the U.S Declaration of Independence with the U.S. Constitution. The Declaration was an expression of the personal convictions of its signers, and it recognized God by stating that all men are endowed by their Creator with certain inalienable rights. However, when it came to writing the Constitution, which was the binding law for a government of all citizens, regardless of their religious convictions, they chose a different course. There is no mention of God in the Constitution. This was not an accident and it certainly was not because the Founding Fathers believed that theology was not important. It was because they understood that one cannot legislate morality. It springs, not from constitutions or laws, but from the hearts and minds of the people. They also understood the necessity of building a social order that was tolerant of all religious persuasions and which, in fact, was dedicated to protecting the right to hold diverse views – exactly as we do in Freedom Force. Who does not see that the same authority that can establish Christianity, in exclusion of all other religions, may establish with the same ease any particular sect of Christians, in exclusion of all other sects? ... Whilst we assert for ourselves a freedom to embrace, to profess, and to observe the Religion which we believe to be of divine origin, we cannot deny an equal freedom to those whose minds have not yet yielded to the evidence which has convinced us. By engendering the church with the state, a sort of mule-animal, capable only of destroying, and not of breeding up, is produced, called, The Church established by Law. ... The Inquisition in Spain does not proceed from the religion originally professed, but from this mule-animal, engendered between the church and the state. The burnings [of alleged witches] in Smithfield proceeded from the same heterogeneous production; and it was the regeneration of this strange animal in England afterwards, that renewed rancor and irreligion among the inhabitants, and that drove the people called Quakers and Dissenters to America. Persecution is not an original feature in any religion; but it is always the strongly marked feature of all law-religions, or religions established by law. Take away the law-establishment, and every religion reassumes its original benignity. It is curious that, in our present day, people of deep religious convictions can work tirelessly for a corporation, giving the largest single portion of their lives to its purposes, without feeling concern over the fact that its bylaws and mission statement do not mention God. They do not hesitate to sign a long-term loan contract for a home or an automobile or a business venture with no mention of God in the documents. They willingly place their life savings into investment programs that make no mention of God anywhere in their literature. They eagerly take an oath to uphold and defend the constitution of their country even though there is no mention of God anywhere in the text of that document. Yet, when it comes to joining with others for the defense of their own freedom, they insist that God must be proclaimed, and they shun any movement that does not resemble their church. I cannot support your organization…. The United States of America was founded on Biblical teachings, and the only way to bring this country back to greatness is by obeying God's word and His commands.… The motto of the American Revolution was: "No King but King Jesus!" George Washington was, of course, the first president of the United States, and to learn that the Encyclopedia says he was a deist is surprising in light of the stories circulated in later years claiming he was a Christian. This can be traced back to the 19th Century writings of Mason Locke Weems, a Christian preacher who created the fable of George Washington and the cherry tree. However, a careful reading of the historical record shows that Washington often referred to "Providence" (implying a divine power directing the affairs of men) but never espoused a specific religion. In the book Washington and Religion by Paul F. Boller, Jr., we read on page 92, "Washington was no infidel, if by infidel is meant unbeliever. Washington had an unquestioning faith in Providence and, as we have seen, he voiced this faith publicly on numerous occasions. That this was no mere rhetorical flourish on his part, designed for public consumption, is apparent from his constant allusions to Providence in his personal letters." On page 82 of the same book, Boller includes a quote from a Presbyterian minister, Arthur B. Bradford, who was an associate of Ashbel Green, another Presbyterian minister who had known George Washington personally. Bradford wrote that Green, "often said in my hearing, though sorrowfully, of course, that while Washington was very deferential to religion and its ceremonies, like nearly all the founders of the Republic, he was not a Christian, but a Deist." Many of the Founding Fathers, like Washington, were deferential to religion even though not professing a specific faith, but some of them, were hostile to religion. Let us re-phrase that. They were not hostile to religion per se but what they perceived to be the exploitation of religion by religious leaders and their earthly organizations. Here are a few examples. President Adams, along with the unanimous vote of the Senate, signed the Treaty of Tripoli on June 7, 1797. Article 11 states: "The government of the United States is not in any sense founded on the Christian religion." It is clear from this sampling that our friend who said the motto of the American Revolution was "No king but King Jesus" had an incomplete view of American history. It is true that Christianity was the most populous religion in colonial America and that many of the mores that became a part of the American political system can be traced to the Christian ethic, yet there were deep divisions between the various sects. Some groups even felt that the others were not really Christian at all but heresies instead. More important, however, is the fact that religion was not the motivator of the American Revolution. It was not a religious crusade but a struggle for personal and economic liberty. General Washington was wise not to quiz his recruits on their theology. He needed every able bodied man who was willing to fight regardless of religious convictions. Freedom Force is following his example. Over the years, I have seen numerous organizations torn apart by disputes over religious issues. I have also seen good people turned away from these organizations because their religious convictions were different from the mainstream membership, and they did not feel welcome. I remember clearly the day in the 1980s when I invited my office manager to a banquet meeting of one of these organizations. It was a well attended event with several speakers, each contributing a different perspective on the Christian heritage of freedom. I thought it was an excellent summary of the many ways in which Christian principles were embedded into the U.S. Constitution and Bill of Rights. At the end of the meeting, I turned to my office manager and asked what she thought of the program? I never will forget her reply or the look on her face as she said: “Very interesting, but there wasn’t much in it for me, was there?” You see, her last name was Perlstein. As a Jew, she appreciated the historical significance of the presentations but she also felt excluded from the group. If she had any desire to join a freedom organization, it would not be this one. That was a great lesson for me and, from that day, forward, I resolved never to generate a program that was not of equal relevance to everyone, regardless of religious convictions. Freedom Force is the continuation of that resolve. Theology is one of my favorite topics. I have had exposure to many diverse faiths and variants within those faiths. I have studied the Bible, the Torah and the Qur’an, although I do not consider myself to be a scholar on any of them. I was raised in a Catholic household and still attend church semi-regularly with my wife, who is a devout adherent to the faith. I have many close friends who are Protestants of various denominations and I have attended their services. In 1969, I co-authored a major portion of a book with Ezra Taft Benson, former Elder of the Church of Jesus Christ of the Latter Day Saints. (I wrote Part Two of An Enemy Hath Done This.) I also have good friends who are Buddhists, Christian Scientists, Moslems, and Scientologists. Many of them are now members of Freedom Force. We often discuss theology and, even though we have different views on many aspects of our respective faiths, we all agree on the probability that life and all the complexities of the universe are the result of intelligent design. We may have different ideas about the nature of that design, but that one exists is, to us, beyond doubt. To assume otherwise would not be logical, because there is no logic that can rationalize “nothing.” However, I also have friends who take a different view even on that issue. It is stimulating to discuss theology with all of these friends because, inevitably, it enlightens me a little more than before, even if only to strengthen my previous convictions. I am always interested in pursuing this most important of all topics but only when I am with those who are strong enough in their conviction to listen to others and share ideas without becoming argumentative or authoritarian. I do not believe that any human being has a perfect understanding of the great complexity of existence. I am anxious to learn from the insight of others, but I am not inclined to push my ideas onto them. For the sake of unity in Freedom Force, it is wise that I do not dwell on this theme. What I personally believe may be of interest to some, but it must never become the focus of our movement. It is what we all believe, as expressed in The Creed of Freedom that is the important issue, and that alone must be our beacon. If we become preoccupied with the personal faith of the leader, we are setting ourselves up for deep trouble when he or she eventually is replaced by someone who may have a different faith. That would splinter the organization and lead to a theological power struggle. We must remember that Freedom Force is not a church and must never become one. I do not offer myself as a spiritual leader and, for reasons previously stated, I feel it would be a mistake to make an issue of my theology. To do so would cause others, including you, to judge our movement on the basis of my personal belief system, and that could lead to needless dissention. I gather from your insistence that, if my theology is in agreement with yours, you will stay as a member; but, if it is different, then you will drop out. If so, this attitude would be in violation of our Code of Conduct, which would disqualify you for membership anyway, even if my answer is acceptable to you. Although I realize you said you have read it, please allow me to repeat the pertinent parts again, because this is the crux of the whole matter: [At this point, I repeated paragraphs 9 and 10 from the Code.] I sincerely hope you agree with the wisdom of this policy. Let us unite for our common mission and get on with the job of fighting the forces of evil. Unfortunately, this did not satisfy my inquisitor. He replied: "Your 'religion` is not similar to mine.... Please cancel my membership." This, of course, we were happy to do. Religious intolerance has no place in Freedom Force. Refusing to join with others because of religious differences may be called, for lack of a better phrase, religious separatism, and this has prevented thousands of people from reaching the full potential of their struggle against the forces of totalitarianism. Yet, there is another phenomenon that is even more deadly. It is religious neutralism. This is the belief that, no matter how bad things are; there is nothing that mortal man can do about it. Everything is in the hands of God, and He will solve all problems when He is ready and we are worthy. Trying to bring about social, economic, or political reform with direct action is a waste of time. Operating on this conviction, people who should be in the forefront of the battle against evil are effectively neutralized by their own religions and fall to the sidelines while others fight the real battles of this world. Religious neutralism can be found within all of the world’s spiritual philosophies. However, it is my opinion that it does not stem from theology but from a subconscious desire to rationalize an avoidance of conflict or controversy. Neutralists often quote passages from holy books to support their position, but it is easy to find other passages from the same books saying that man has an obligation to fight against evil. Neutralists ignore those passages and focus only on those that seem to justify inaction and temporary safety. Many spiritually minded people are drawn into this because it allows them to avoid the rigors of resistance and, at the same time, it bestows upon them an aura of righteousness. Instead of seeing themselves as shirking the most important challenge of their lives, they can assume the mantle of holiness and wisdom. These people are precisely the ones who should be in the forefront of opposition to tyranny, but they have been neutralized by fear in the disguise of spirituality. People don’t want to be labeled, wear a symbol, and brainwash/coerce others. We just want freedom of mind, and freedom from state. An organization is targetable; it is identifiable; it is crushable by another organization larger than itself. … The secret that lies in Taoism, is that you can’t name it, you can’t talk about it, you can’t touch or quantify it. It is a state of understanding. As soon as you label it or talk about it, you've lost it. Taoism is that little bit of magic, when the people go looking and find out for themselves. It’s lost when you force others to read about it. So there you have it: We don’t have to do anything except have a magic secret. Then the world will find us and, somehow, the collectivists will lose their power. Please excuse my skepticism, but I don’t think thepower elite are trembling over this threat. A customer recently sent me a book entitled Handbook for The New Paradigm, which presents the view that we have little to worry about, because there is a growing universal consciousness that soon will engulf the entire world with truth and light. At the last minute, everyone will be united against the forces of totalitarianism, which then will disappear from the earth. The first part of this book is appealing because it accurately describes what is happening in the world. There is little with which I can disagree in that part. However, when we get to the second part, I am not enthusiastic about urging everyone to become at one with the universe or plug in to a universal consciousness to reverse the present destructive trends in the world. Why not? Because, frankly, I do not have confidence that it will work! In fact, I think it is just one more way in which the enemies of freedom neutralize their intended victims into doing nothing. As the book’s author said, the power of universal consciousness is without past human experience. Therefore, at best, it must be regarded as speculative theory, not proven strategy. However, I do have confidence based on historical events that, in addition to universal consciousness (if, indeed, such a thing exists), we can translate the essence of that consciousness into real-life, three-dimensional reality. The essence of that consciousness is embodied in The Creed of Freedom. Thinking and feeling good about our connectivity to humanity is not enough. One megalomaniac who is not so connected – and there will always be plenty of them – can always push a button, pull a trigger, or, more likely, deceive the connected ones into their own enslavement. Most of those who today are concerned over the destructive forces in the world have not the slightest idea of what to do about it or how to construct a better social model. All they know is that they don’t like the present one. In their naivety, they think that, just because they are pure of heart, somehow, if they all got together, they would know how to do things better. In truth, without a ideology or a strategy of their own and without knowledge of the tactics of the deceivers, they will continue to be fooled and led by cunning men. In addition to the spiritual aspect of our nature, we also have a flesh-and-blood life to live in a brick-and-mortar world. We need to attend to both. I think not; man has become complacent; believes his environment can be improved upon. As if man has any say-so or power to do anything different than what has been done? When Israelites were enslaved, what remedy was invoked? Can you lead the slaves to a new land? Biblically speaking, the word has been corrupted; likened unto all books/knowledge. The greatest sin is the "pride of knowledge" likened unto the days of Noah. Knowledge/history will not provide a way through the sea of this world. Only the voice of the Creator. There needs to be a band of those who understand this in order to hear which way to go. My dear Eva, I am so sorry to see that the Prince of Darkness has lulled you into apathy. He must laugh at the spectacle of righteous people refusing to stand against him because they are convinced it is no use. You say the word has been corrupted. I can think of no greater corruption than using Scripture to justify not opposing evil. As for me, I intend to stand for freedom regardless of the odds. Where is the virtue of defending our families only if we are assured that we will win? This is not a football game in which our objective is to see which team gets the highest score or who wins the betting pool. Give me men and women who value principle above victory. Besides, it is not hopeless. We can win if enough of us are willing to make the necessary effort and sacrifice. You say that knowledge of history will not provide a way through the sea of this world. You are correct. That is why members of Freedom Force do not stop at knowledge; why they are pro-active and seek influence within political and social movements. You say that there needs to be a band of those who will know which way to go. You are correct again. That is exactly what we hope to become. Sorry you will not be with us in our stand against evil and slavery. I fear that you have no idea of what awaits you and your loved ones if we should fail. Please pray that someone else will step forward to take your place. Within the Christian community it is common to hear people claim that we are all wasting our time trying to fight against totalitarianism because – according to them – we are living in the end times as prophesied in the Bible, and there is nothing we can do to stop it. Prophesies of the end times are as old as Christianity itself. People in every generation have thought that it would come to pass in their lifetime, especially if they were living in a period of famine and war, which, of course, has been a common condition throughout most of history. I have been hearing these prophecies ever since I became aware of the present world crisis in 1960. In those days, many believed that there would be a global atomic holocaust any day, and there were plenty of signs, dreams, and visions to support that conclusion. Unfortunately, that led untold thousands to believe that it was pointless to try to do anything to stop the forces of evil, because everything was prophesied and predetermined. It was as though the triumph of evil was God's will. I think some of these people even looked forward to the collapse of civilization with a certain degree of anticipation and glee – expecting that only evil people would suffer while they, of course, would be spared. For over forty years, these well-intentioned souls have been neutralized into passive acceptance of tyranny when they could have and should have been fierce defenders of freedom. The would-be rulers of the world are very pleased with those who do nothing except wait for the fulfillment of prophecy, for they are completely out of the battle and pose no threat to the New World Order. There are millions of human beings today living under totalitarian regimes who have a deep religious conviction, but that has not saved them. They are living in a hell of slavery, oppression, humiliation, and even torture. We and our children will be no different if we do not turn the tide. We must not sit back and expect God to toss a bolt of lightning at our enemies. If you believe that only God can change the course of history, then consider that He will do it through people – just like you and me. We must be ready and willing to be His instruments. As the old saying goes: Pray for potatoes, then reach for the hoe. It is my conviction that God did not give man intelligence and free will so he could become a slave to rulers. The gates of heaven surely are closed to those who decline to oppose totalitarianism with all their might. Yes, we are living in the end times. Each of us is on a collision course with death, and it will come much sooner than we would like to think. I believe we should all live our lives in such a way that we are prepared to meet our Maker at a moment's notice. That means we must do something worthy with our lives. For starters, we should be manning the ramparts of freedom. Who knows? Mankind just might have another forty years – or four hundred years – or four thousand. Wherever we are along the journey of life, let's not waste this wonderful opportunity to make a difference for future generations. Tyrants love all forms of neutralism, and they undoubtedly use their financial resources to encourage it, but the one they must love the most is religious neutralism. What great irony it is that religious people, who should be the fiercest activists in the battle against evil, can be lead into being totally passive. This is the ultimate deception. It is easier to preach about the battle against evil than engage in it. Those who seek to avoid conflict excuse their absence by saying that their real business is not of this world. Yet, they devote endless time and energy in pursuit of money, career, and prestige. They may deceive themselves, but they do not deceive us. Sadly, we have come to accept that these people will not join the battle and will be of no value in the defense of our freedom in the crucial days ahead. So we simply state our case in hopes of bringing them to reality and then move on to others who will stand against evil in this world. Within the Catholic community, there are many devout people who believe that war and human suffering in the word cannot be ended except by a miracle from God. This miracle will happen, they believe, when the Pope and Bishops of the Church perform a ceremony, called a consecration, that names Russia as the country being consecrated. That is the message they say came from the Virgin Mary who appeared before three shepherd children from the village of Fatima, Portugal, in the year 1917. Their intense focus, therefore, is on praying to Mary and trying to convince Church leaders to perform the ceremony. These good people are seldom interested in political or social activism because, after all, God is going to handle everything. If wars continue to plague the world or if we all are enslaved, not by Russia, but within the country of our birth, they will not see their own inaction as a contributing factor. Instead, they will say it is because we are a sinful nation, and the Church failed to do its job. Freedom Force is a large ideological umbrella under which men and women of all faiths can work for common cause. It is not a church. Most of our members belong to a church, but they recognize that this, alone, is not the answer. If it were, the churches of the world would now be in the forefront of resisting the rise of tyranny. Unfortunately, they are not and, in many cases, they are even on the side of collectivism. We must let churches do what churches do – but we also must have a broad coalition of freedom loving people of all faiths doing what churches cannot do. One does not have to choose. We need both. Immediately after posting this to our web site, we began to receive messages of support and appreciation for the wisdom of this policy. The following examples are typical. I appreciate enormously your position on religion. As an "historical" Jew – non-practicing and who shuns all religious dogma, who also is a professional fine artist and is married to an East Indian (Hindu) – I tread carefully when getting involved in things political of any nature. Fact is, I am not a ‘joiner’ (and certainly not a collectivist), but a devout loner. I mention this because I recognize that my background is somewhat atypical, and your mention of ‘diversity’ being welcome is of comfort. Personally, I think diversity is a strong point. I am very glad to have discovered Freedom Force. As a translated Christian, I wholeheartedly endorse the position of Freedom Force on the topic of religion. It is disturbing to me that so many of my fellow-Christians insist that those in political movements must have identical theological views to theirs. They certainly do not require that of those who attend their church. Hardly any two members of the same church today hold precisely the same theological views. Our nation was based upon an idea that ... government must protect the life, liberty, and property of its citizens regardless of their theology. This is the foundation of our common cause, the tree of our liberty. Let us defend it with all that is within us and, if we are successful, then we will have the freedom and leisure to discuss the divine seed from which that tree has grown. If we should fail, such discussion will be of no value and of little interest to the enslaved. I am extremely pleased by this essay, because it shows that Freedom Force International has set the greatest example I have ever witnessed of how people can work together despite different religious beliefs. The separation of religion from government is the only guarantee of religious freedom. As a Buddhist, it makes me feel very uncomfortable to hear people of other faiths insist on having their religious doctrines infused into our government and tax-supported schools. I care not what they believe or teach in their own private schools, but I care intensely what they teach my children in public schools which I am forced to support through taxes. I hope people understand the significance of Mr. Griffin’s essay. It is no small thing. These concepts have given me a powerful and wonderful feeling, a feeling of belonging to an organization that respects me. What a perfect example of a true republic, a principle held in our Constitution that our country was originally founded on. The recent trend of pushing religion into government is tearing our country apart. It is tearing the world apart. In contrast, by following the Freedom Force model, people will learn how to share and respect the many diverse religious beliefs from every walk of life and all parts of the world. People will feel a balance of fairness and equality. Thank you Freedom Force International! The following letter was received on December 31, 2008. Thank you for sending me the link on the role of religion in Freedom Force. In my opinion this is a very important section. May I say, with all intent at compliment, that you remind me of the great Christian theologian, Francis Schaeffer, who challenged an entire generation of young people back in the 70s and 80s. And it would seem to me that the Freedom Force message would find a receptive audience on many college campuses today. This could be a fertile recruiting ground where we find tomorrow's leaders. And so, as a strong evangelical Christian, I am behind you and Freedom Force 100%. I will support you in any way I can from here on out. I also appreciate the fact that Freedom Force is inclusive of all belief systems; this makes it even stronger because although we may disagree on theology and other issues, we are all very passionately united and committed to the worth and dignity of each human being, and we insist that each person be treated as an individual and be allowed to fulfill his or her God-given potential. Madison, "A Memorial and Remonstrance against Religious Assessments", addressed to the Virginia General Assembly, June 20, 1785, http://religiousfreedom.lib.virginia.edu/sacred/madison_m&r_1785.html, p. 2. The Autobiography of Benjamin Franklin, Chapter VI. http://www.earlyamerica.com/lives/franklin/chapt6/. Thomas Paine, Age of Reason, Part 1, Section 1. http://www.ushistory.org/Paine/reason/reason1.htm. "George Washington and Deism," http://www.deism.com/washington.htm. "Thomas Jefferson to Samuel Kercheval", January 19, 1810. The Thomas Jefferson Papers Series 1. General Correspondence. 1651-1827. Library of Congress, Handwritten manuscript, image 530. http://memory.loc.gov/master/mss/mtj/mtj1/044/0500/0530.jpg. Thomas Paine, Age of Reason, First Part, Section 6. http://www.ushistory.org/paine/reason/reason6.htm. Madison: "A Memorial and Remonstrance against Religious Assessments", addressed to the Virginia General Assembly, June 20, 1785, http://religiousfreedom.lib.virginia.edu/sacred/madison_m&r_1785.html, p. 2. 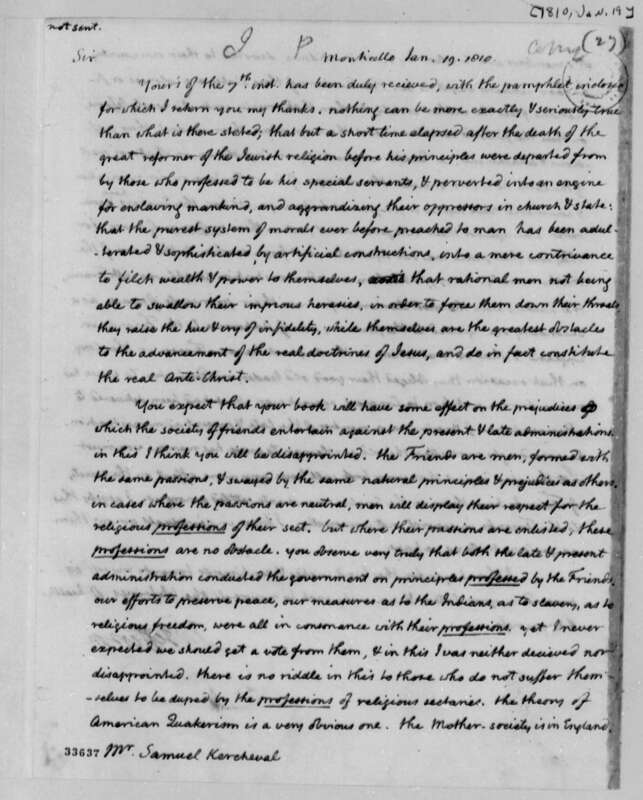 John Adams Diary, February 18, 1756, Adams Electronic Archive, http://www.masshist.org/digitaladams/aea/cfm/doc.cfm?id=D1.